This is a library/wiki/community dedicated to music games (aka gamepieces). What is a "music game?" 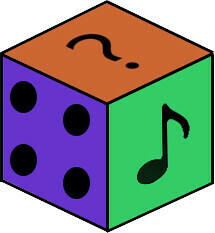 - A set of rules that control players to spontaneously create music. Usually during a performance. Usually great fun! 'Games For Music' was created in March 2018 by two music game designers (odolany & notrightmusic) who are both active in setting up music game meetings and participating in them (the page is a great tool for organizing materials for such meetings). Communities like this can not thrive and continue without you. So please have a look around. Try out some games. Ask questions, give suggestions or start your own discussions. We'd love for you to contribute any games you have created. We will be working on this community daily. Building it up to be the greatest, central hub for music games. We don't have a plan to monetize this page in any way (if you see an ad, it's from wikidot itself, and ads are not shown to logged in users, join us! ;) ).